Take a look at any "Worst" or "Insane" list involving either Marvel or The Punisher and you'll come across a strange time in Punisher's history when he had killed himself and come back to life with heavenly (READ: Super) powers given to him by an angel (who was responsible for the death of Frank Castle's family and him becoming The Punisher) so that both he and The Punisher could seek redemption in the eyes of Heaven. . .
Needless to say, this new status quo was NOT popular with the fans. Hell, even the much-maligned "Franken-Castle" arc lasted longer. Punisher as a heavenly avenger lasted exactly two 4 issue mini's and a handful of references here and there later on. This is the second of those mini's and the last time the comics world would see The Punisher in undead heavenly avenger mode. I don't have all the issues of the mini that introduced this idea, but for what it's worth, from what I've read this is the better of the two. And so with a hearty, "Welcome to the 90's!" let's take a look, shall we? 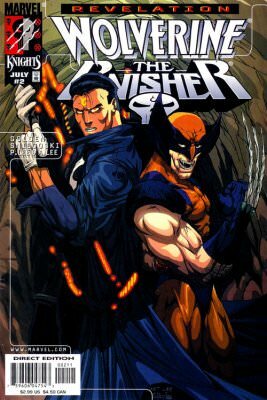 Wolverine and Punisher are both enjoying a moment of peace in their crazy lives when construction workers accidentally discover hidden tunnels deep under New York City and unleash an imprisoned being that causes sickness and death. . . The first issue of this mini is off to a pretty good start, even though it's part of what's widely regarded as one of the most WTF times in Punisher's history (SHORT VERSION: He killed himself and was brought back to life and given angelic powers in order to be a warrior for heaven and join his family in paradise. The 90's. Just roll with it). 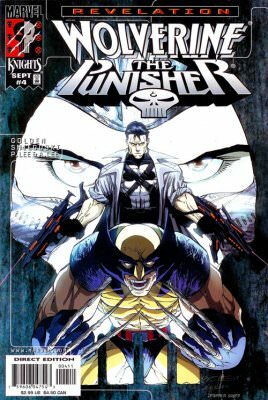 It's mostly setup in order to throw Punisher into a Wolverine story. . .or maybe it's the other way around. Hard to tell. But the issue does a good job moving the pieces onto the board by introducing the title characters, the threat, and the reasons for them to face the threat. The Anime/Manga style art by Pat Lee is very nicely done. Not as good as DarkMinds, but his art style fits this story pretty well, even making Punisher's somewhat ridiculous heaven guns look a LOT better than Wrightson did in the original "Punisher as an angel" Marvel Knights mini. The cover is very nicely done as well. The only thing about the art I didn't like was Wolverine's amazingly triangular hair. . .but hey, 90's, right? Overall, a surprisingly strong start. 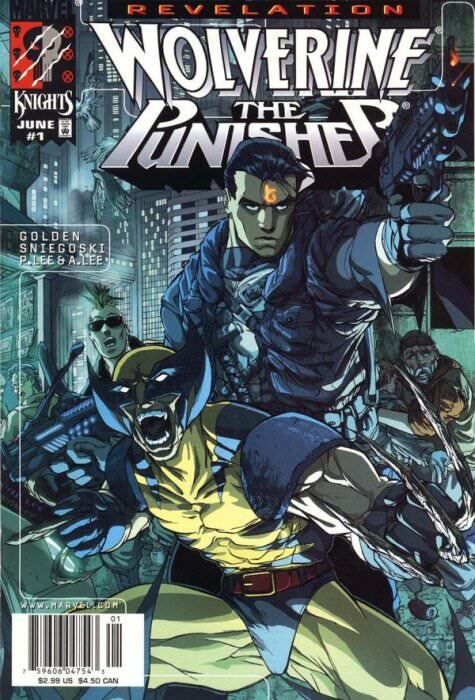 Wolverine and Punisher meet up in the tunnels beneath New York City while panic breaks out as the contagion spreads sickness and death above. The source of the contagion, a Morlock named Revelation, has been driven insane by years of captivity and is convinced she's in hell and must escape. . .
After a pretty strong opening issue, Marvel pours weaksauce on the second. The art takes a swerve for the worse, including a god-awful cover. There's TEN FU*KING PAGES of exposition (About a third of the book)! And the. . .er. . .revelation. . .that Revelation is a Morlock who was imprisoned because her mutation was a death aura. Correct me if I'm wrong, fellow comic nerds. . .but weren't The Morlocks basically hideous homeless mutants that lived as scavengers? They weren't high-tech people with advanced cryogenic laboratories and a legion of robotic sentries. Am I wrong here? Am I remembering things wrong? Anyway, Punisher and Wolverine meet up and engage in the obligatory "We fight until we realize we're on the same side" trope, and then things devolve into robot punching. 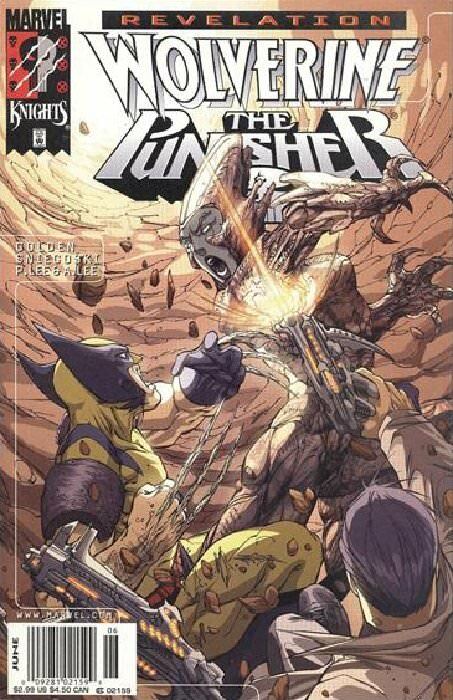 The Mutant Revelation continues to make her way to the surface, pursued by Punisher and Wolverine. After Punisher is badly wounded, he becomes convinced the only way to stop Revelation is to kill her. Wolverine becomes the surprising voice of reason and reminds Punisher that he's been given a chance at redemption, and that usually doesn't include killing the innocent. The proceedings are watched closely by a council of angels who decide to test whether or not Frank Castle deserves the power of heaven and a second chance to be with his family. The art in this issue thankfully swerves back to the good side of things. . .with the exception of the strange way the pointy side eye/ear/mask thingy (I really don't know what to call it. His mask?) on Wolverine is drawn. It's just bad. So bad. Also, for some strange reason, the angels watching and testing The Punisher are wearing the same super science carapace body armor as Revelation. Storywise, we continue to get massive info dumps and exposition. Every issue so far has gone over the background of Wolverine, Punisher, and Revelation until at this point, about half the book is background material with very little story actually taking place. And again. . .the Morlocks are portrayed as super-science high tech mutants instead of grungy scavengers. Oh. . .and Punisher gets a steel I-Beam punched through his chest and walks it off after Wolverine pulls it out. New healing factor bro! Overall, there wasn't much to this one. The issue was stuffed with exposition and I'm thinking this mini could have been a two-shot instead of a 4 parter. In the final confrontation with Revelation, Punisher resists killing her and convinces the Council of Thrones that he is worthy of redemption. Oh. . .and he stuffs a nuclear bomb into a dimensional pocket of his trench coat, where it explodes harmlessly somewhere in heaven. So here we are at the end of things for this mini AND Punisher as an angel (it was referenced a few times after this, but never shown again). I have to admit that the ending of this mini was actually pretty good. To tell the truth, based on some of the dangling story threads here, I think there was some potential for Punisher Angel. . .call me crazy! But that aside, this was a good ending to the mini. The only parts that REALLY stuck out as bad were the whole "Putting a nuke into a handy deus ex dimensional trenchcoat pocket", and Wolverine refusing to believe in heaven AFTER HE WENT TO HELL WITH GHOST RIDER AND PUNISHER BEFORE! And not for nuthin' after he sees angels come down to collect the innocent soul of Revelation. Overall, I came away from this Xtremely 90's relic of a strange time at Marvel Comics with two main impressions. The First was that, even though the character didn't seem to have been handled or presented very well, there actually WAS some potential in a supernatural-based Punisher. There were just little glimmers of it here, but maybe they should have given it a bit more of a chance. I know, I know. . .call me crazy. The second main impression I got from this mini was that there was actually only enough story for two issues. This is a series that is HEAVILY padded with background and exposition. I really, REALLY like Pat Lee's art. . .DarkMinds is one of my all-around favorite series. . .but this time out, I was a bit disappointed. There were some very nice moments here and there, but this wasn't close to his best work. All in all, if I had to describe this curiosity in one word, it would be: Disappointing. It wasted a potentially interesting character to the point that it was never seen again. Instead we got a lot of robot punching. A damn shame. Everything is better with some Wolverine in it, right? RIGHT? More Wolv-Tastic teamup action with Marvel's Gambit/Wolverine: Victims mini. There's a reason this mini-series was such a mess. Marvel should not have included Punisher in any kind of supernatural story EVER!! !